It's been over a month now since I switched from Comcast to Verizon and I've learned a few things. Verizon's line is still laying over my lawn and my neighbor's lawn. The line is thin and hard to see so it is both a trip hazard (lawsuit anyone?) and likely to be cut. I like to think I mow carefully but I do have to constantly remember that line is laying hidden like a snake in the grass. I cannot imagine why Verizon isn't being responsible on this issue. I still haven't come up with a way to silence the battery backup unit. As I mentioned previously, it's inappropriate to have the unit beep every time the electricity goes out. I'm not talking about the 6 to 24 hour outages that strike once or twice a year. I mean the two or three second glitches that occur repeatedly, sometimes several times in an hour. It's crazy to be woken up for that. I googled for "silence Verizon battery backup" and, not surprisingly, found many pages where people described how to silence the unit completely by physically disabling the beeper. However I want the unit to alert me when the battery needs replacing, not when the power fails. Verizon - help me out here! Got my first Verizon bill. It contained two surprises. The first was that I found no tax or additional fees. As I mentioned previously, before signing up, Verizon could not tell me what the taxes or additional fees would be. I contacted many people including Verizon's own billing department. They only gave estimates with very large ranges. After signing up, the computer generated a specific number. However it didn't match what was on my real bill. I repeat: there were no taxes or fees on my bill. How can this be? After all, Comcast has been charging me taxes for years. Am I going to be surprised next month or next year when Verizon recomputes the bill? Is anyone else getting internet-only FiOS with no taxes? The second surprise is that my bill said "Make check payable to Verizon." 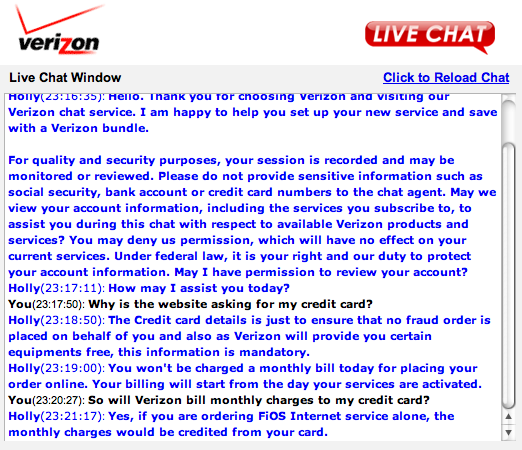 But when I signed up, the Verizon website insisted I had to provide a credit card. Look at the picture below. It says "Your Bill Info (required)" and "Please provide your credit card details for your order." 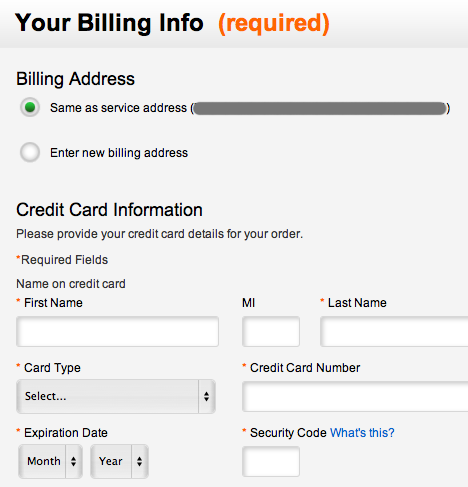 It even highlights "required" in orange. Holly : Yes, if you are ordering FiOS Internet service alone, the monthly charges would be credited from your card. Here's a picture so you can see my question in context. Needless to say, when I got my bill, I didn't pay it, assuming I'd see the charge on my credit card statement. But after a week, it occurred to me I should be sure. I called Verizon and spoke to a representative who told me the opposite - that I should write a check. Is it possible that when I changed from paperless to paper bills, that shifted my payments back to check as well? If so, that certainly wasn't clear from Verizon's website. I'd go back and get some screenshots of those descriptions but at this point, I don't trust the website to leave me with paper bills. It appears that just trying to read those screens automatically shifts you to paperless billing. To date, I've called Verizon by telephone a number of times - perhaps 6 or 7. Each time is a struggle. Getting through the phone tree is not so bad. It asks for my phone number, zip code, TV vs internet, home vs business, etc. Finally, I end up speaking to a person who asks who I am. Wait - didn't you get all the stuff I just entered? No, please give me the phone number on your account. I already know what's going to happen next. The Verizon rep will say Sorry, we don't have that number in the system. After this happened on several calls, a rep finally explained We can only look phone numbers up if they're Verizon phone numbers. Well, that's idiotic. And it's even more idiotic to ask for a phone number if there's a good chance the info won't be usable. But why won't Verizon use my phone number? Last week when I called, I figured I'd save time and told the rep I had no phone number. Ok, what's your name. I give him my name. Sorry, I cannot find that in the system. Then can I give you my account number? Sure, go ahead. Upon giving him my account number, he couldn't find that either. He then asked for a callback number. I told him there was no point since my number isn't in the system. Instead, I asked if he could try looking my up by my address. Ok, what's your address? I gave him my address and finally, he found my account. I then asked him what was the most expedient way of authenticating myself to Verizon. He said: Just tell us to look you up by your emergency contact number. It doesn't have to be a Verizon number. And we have it in your account. So when I next called up, I offered my "emergency contact number" as I had been instructed. The rep said he never heard of such a thing. I explained why I offered it and he said it made no sense to him that another rep had said such a thing. I asked him the most expedient way to identify myself and he said they fall back to looking people up by name. So I gave him my name. Sorry, can't find you. What's your street address? State? City? I pointed out to the representative that not only had I entered my phone number but I had already entered my zip code. So while I understood the Verizon phone tree was throwing away my phone number, why did he have to ask for my state and city when that should be evident from my zip? Answer: Verizon only uses the zip code to confirm a Verizon phone number! So since the number wasn't recognized, the zip I had entered was discarded too. I asked him if there's a way to bypass the computer voice that asks for my phone and zip? Yes he said Next time you call, say 'agent' and that will get you right to a person. Then when a person answers and asks for your phone number, tell them you should be looked up by your address. So I dialed Verizon again and when the computer voice asked for my phone number, I said "Agent". It didn't work. Why does Verizon have such a hard time authenticating people? And why do the representatives give completely different instructions for dealing with Verizon? And why don't any of their instructions work? Are they just making this stuff up as they go along? But Verizon isn't the only one having a hard time believing me. Comcast has now contacted me about my cable modem. Several times. A week or so after I dropped Comcast, a woman called me to tell me to I return the modem. I told her I had. Her records indicated I had not. I told her I had (again). I didn't have the receipt handy but I described the whole visit to Comcast, the date, etc. She seemed satisfied and said she'd correct the error. Then a week later, I got a letter telling me that I would be charged $500 if I didn't return the modem. I figured the letter hadn't caught up with the earlier correction so I ignored it. A week after that, I got a phone call from a collections agency! I googled the number and found many people had complained about Comcast "arranging" for this collections agency. So at this point Comcast owes me a refund (based on my last prepayment - since Comcast bills in advance) while at the same time asserting that I owe them $500 or their equipment. At the end of this most recent phone call to Comcast, a company with which I have chosen not to continue service, I was amused to hear the representative end the call with the customary "Thank you for choosing Comcast!" Now about that line laying on the lawn. I reported the line to Verizon and the representative said It's been laying on the ground for a month? That should never happen. He said he would file an emergency request to get it removed. I pointed out that it was not an emergency per se - they didn't need to come fix it on the weekend, it had already been out there for a month so I could live with it over the weekend. But he said it's illegal to leave cables laying on the ground. Plus he said his screen gave him no other way to report the problem but as an emergency and I would get a call back the following morning (i.e., Saturday) prior to someone coming out to fix it. So I had to explain the problem yet again to the representative in the billing department. He didn't argue. With no hesitation he issued me a credit for the entire amount of my first month's bill. The way he took my story in stride made me wonder: Was he just a very generous person or just tired of hearing similar stories? The following morning, I waited for the call promised by the previous representative. No call. No call the remainder of the day or the following day. In fact, it's now been five days since Verizon asserted my line to be illegal and its removal an emergency. And five weeks total that the line has lain across my lawn and my neighbor's lawn. Maybe you should order the $12.99 per month FiOS TV local product so that your issue would fall under the jurisdiction of the Montgomery County Cable office. Nothing stopping you from canceling it later. Sadly, you have had a relatively easy time of it getting FIOS installed, Don, relative to the Kafka-esque multi-week long debacle I experienced. Just one little piece of my saga: after months announcing to my condo that Fios was coming, FIOS was installed in my condo, not without weeks of problems getting it properly connected from the street to the apartments. with heavy condo association and resident involvement. Then, every resident got an 8 1/2 X 11 flyer in his/her mail with the announcement "I'ts here"! Call this number or go to this web site to start your service now! So, some of us tried. Only to find the web link was dead, and there was nowhere on the Verizon site to go to sign up for our neighborhood! Calling the advertised number resulted in a dead line that simply disconnected. Calling Verizon "Customer Service" resulted in repeated claims that there was no FIOS available at our building. At this point, I was so desperate due to the unconscionably poor service from Comcast, I persisted. Now I learned from Verizon that there couldn't be any FIOS at our building because Verizon had no phone lines installed at our address. Despite the fact that most residents there had been using Verizon phone service for YEARS. From here, it actually gets worse - but this is a story for another day.